I was having a hard time downloading the picture prompt. Click here to view the picture before or after reading my little poem. In an Alice in Wonderland tree. Cruel branches, knobby and angular. Who fell in spring at Monte Cassino. I am writing in response to Annie’s Prompt. I’ve not written a lot with visual prompts. Usually my prompts are written. So, we shall see how this goes. I found the pic and prompt over at her blog in, Writing Outside The Lines. 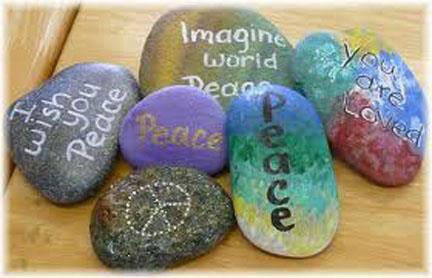 Here is the prompt: (I can write about the words on a few of the rocks, or all the rocks, lots of options. I want to talk about the colors. The purple Peace is lovely. What I want to write about are my feelings right now. They are wavy and very confused and hurting in a way that feels palpable to me. Someone recently told me they appreciated my complexity. That felt comforting. I am feeling strangely determined. I am feeling hurt. It is visceral. I feel it in my heart. If I write will I comfort myself?